Gagosian New York is pleased to present Buddha's Fingers (2014–15), one of the late Chris Burden's last works. It's about trying to frame something. And draw attention to it and say, “Here’s the beauty in this. I'm going to put a frame around it, and I think this is beautiful.” That’s what artists do. It’s really a pointing activity. Beginning with a series of startling actions in the early 1970s, Chris Burden challenged his own mental and physical limitations, as well as the boundaries of art and performance. Shut inside a locker for five days (Five Day Locker, 1971); shot in the arm (Shoot, 1971); and nailed through the palms of his hands to the roof of a car (Trans-fixed, 1974), he sought to reflect the violence that defined American politics, society, and media at the time. Burden soon channeled the daring spirit of these early performances into imposing technical feats that similarly explored challenges both individual and social. He used toys (figurines, train sets, Erector parts) as the building blocks for expansive scale models of buildings, dystopic cities, and battlefields, while deploying actual vehicles (ships, trucks, and cars) in surreal and improbable ways. Buddha's Fingers (2014–15) is a dense cluster of thirty-two antique cast-iron vernacular street lamps, electrified with cool, bright LED bulbs and standing almost twelve feet tall. 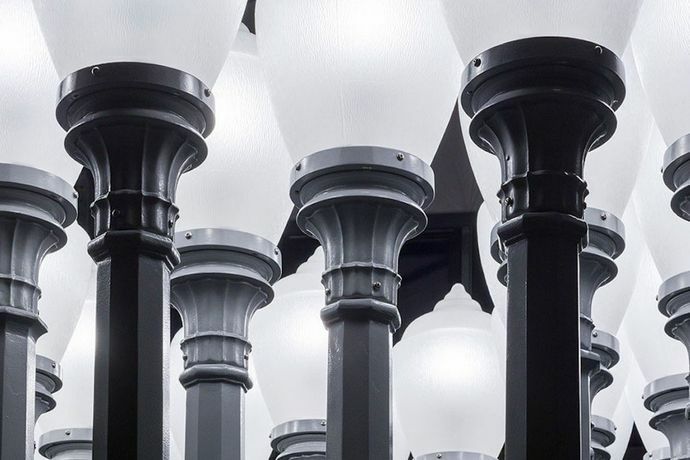 The work is related to Urban Light (2008), Burden's celebrated permanent installation of 202 lamp posts, which stands at the entrance to LACMA in Los Angeles. In 2000, Burden began collecting the street lamps that used to line residential streets in Los Angeles during the 1920s and 1930s, and repurposed them as sculptural installations. In Buddha’s Fingers, the hexagonal lamp bases are set in a tight honeycomb formation. The whimsical title refers to the fingered citrus fruit “buddha's hand,” a recurrent still-life motif and subject in classical Asian art, and a religious symbol of happiness, longevity, and good fortune.